Help this poor guy out. We've heard about how social media helped bring two strangers together (you guys should so check out this Snapchat love story), and this Malaysian man is hoping the public would be able to help him look for the love of his life too. 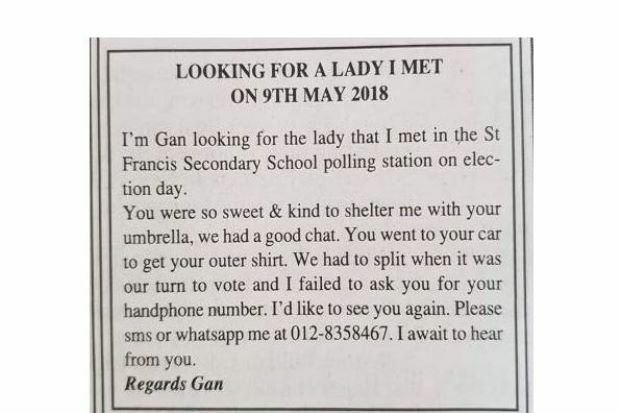 The man, who only identified himself as Gan, posted an advertisement in a Sabah newspaper on Wednesday looking for a woman he met during polling day. The advertisement titled '“Looking for a Lady I Met on 9th May 2018” has since gone viral on social media. According to The Star Online, Gan met the girl during Polling Day when she shared her umbrella with him while they were waiting for their turn to vote under the scorching hot sun. They instantly hit it off, chatting about everything under the sun (pun unintended) for about 20 minutes before they went their separate ways. Then, Gan did not do the one thing he should have done before she left: get her phone number. Since then, the Sabahan told the news portal that he "can’t get her off my mind" and he has been thinking about her for months. Gan told The Star Online that he has no ill intentions; he just wanted to befriend her and maybe "go out for a cup of coffee". 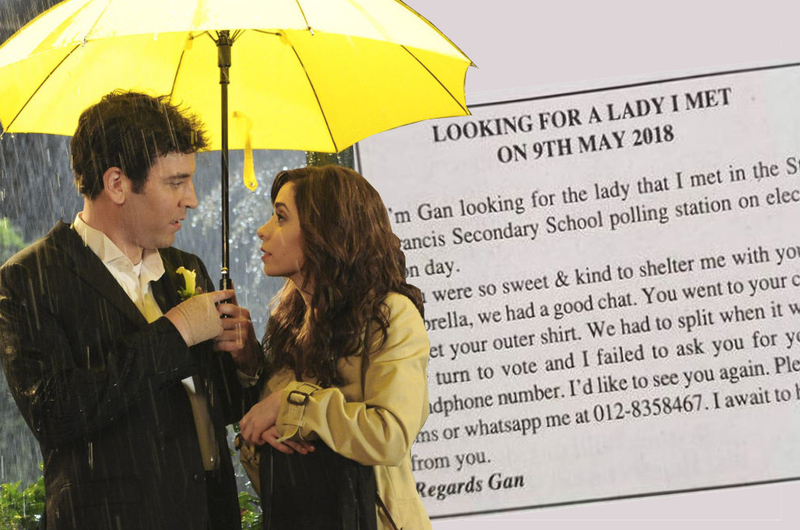 With the advertisement, Gan hopes that his 'umbrella girl' -- cute with short hair and about 160cm in height, he told the news portal -- would call him maybe. Well, we wish you all the best, Gan. Let's just hope he's still single or something. This M'sian Couple Worked On Their Marriage...By Backpacking Around The World! Why Are Malaysians Getting Married In Thailand?